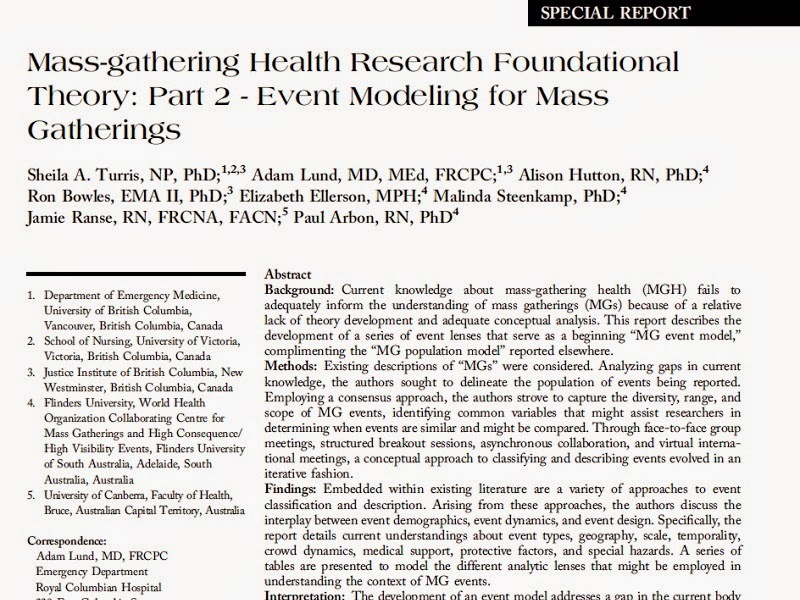 Mass-gathering health research foundational theory: Part 2 - Event modelling for mass gatherings. Background: Current knowledge about mass-gathering health (MGH) fails to adequately inform the understanding of mass gatherings (MGs) because of a relative lack of theory development and adequate conceptual analysis. This report describes the development of a series of event lenses that serve as a beginning ‘‘MG event model,’’ complimenting the ‘‘MG population model’’ reported elsewhere. Methods: Existing descriptions of ‘‘MGs’’ were considered. Analyzing gaps in current knowledge, the authors sought to delineate the population of events being reported. Employing a consensus approach, the authors strove to capture the diversity, range, and scope of MG events, identifying common variables that might assist researchers in determining when events are similar and might be compared. Through face-to-face group meetings, structured breakout sessions, asynchronous collaboration, and virtual international meetings, a conceptual approach to classifying and describing events evolved in an iterative fashion. Findings: Embedded within existing literature are a variety of approaches to event classification and description. Arising from these approaches, the authors discuss the interplay between event demographics, event dynamics, and event design. Specifically, the report details current understandings about event types, geography, scale, temporarily, crowd dynamics, medical support, protective factors, and special hazards. A series of tables are presented to model the different analytic lenses that might be employed in understanding the context of MG events. Interpretation: The development of an event model addresses a gap in the current body of knowledge vis a vis understanding and reporting the full scope of the health effects related to MGs. Consistent use of a consensus-based event model will support more rigorous data collection. This in turn will support meta-analysis, create a foundation for risk assessment, allow for the pooling of data for illness and injury prediction, and support methodology for evaluating health promotion, harm reduction, and clinical response interventions at MGs.